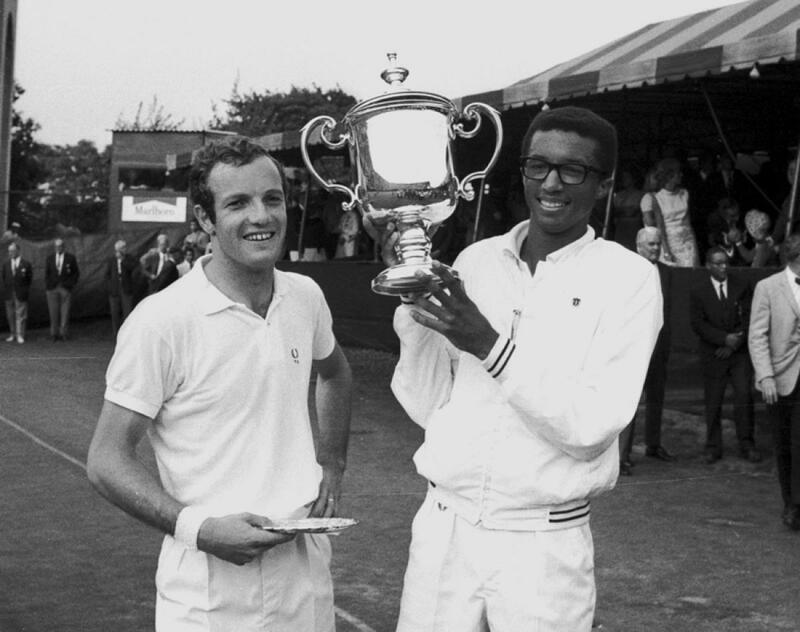 Arthur Ashe holds his trophy after defeating Tom Okker (l.), of the Netherlands, to win the 1968 U.S. Open at Forest Hills. The US Open was originally known as the most exclusive tournament of them all. Strictly for the eyes of the upper class, this Grand Slam event first began in 1881, hosted by the crème de la crème of Rhode Island, the Newport Casino- an extremely elite summer resort for the rich and famous. Not surprisingly, what came to be known as the US National Singles Championships for Men was exclusive to only males who were members allied to the US National Lawn Tennis Association. Six years later, the first women's singles event took place at the Philadelphia Cricket Club, and shortly after, the women's singles, doubles, and mixed doubles combined with the men's events. The foundation of the US Open was officially formed. The passion for tennis began to gain steam, and because of the heightened desire in 1915, the tournament moved onto a bigger and better turf- the West Side Tennis Club in Forest Hills, New York. Here, the game of tennis saw extraordinary transformations. In the late 1920's, the introduction of seeding occurred; a couple decades after, the first African-American woman, Althea Gibson, competed in a Grand Slam event. The renowned Billie Jean King took on the challenge of new technology and won the first Grand Slam with a metal racquet in 1967; the establishment of tiebreakers in 1970, equal prize money for both males and females just three years later; and in 1975, the first night matches were played. It was at Forest Hills that the tennis game metamorphosed forever. But, in the late 1970's, the tournament made its last move to Flushing Meadows, equipped with hard courts and DecoTurf surfaces, where the tournament currently resides. The US Open has transformed from a private men's tournament into one of the largest sporting events in the world, drawing over 700,000 fans each year. Night matches on Arthur Ashe Stadium, the Red Star Cafe, a number of shopping & dining options, live music each day, all serve to make the US Open both a tennis & entertainment event not to be missed!